I guess when you have 40-some teams in your league, most people wouldn't want to broadcast the eighteen play-in games. Actually it's only technically four play-in games, as the Tourney will allow every team in the conference into the Tournament, but I still find it odd that not a single network wants to broadcast the first round of the Big East Tournament. Not even the conference's own network is interested in airing the early round action. 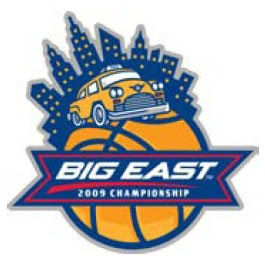 With the 2009 BIG EAST Women's and Men's Basketball Championships including more games and more teams than in any previous year, the conference is announcing unprecedented online coverage of the tournaments on www.BIGEAST.org, powered by JumpTV (TSX: JTV). The BIG EAST, in conjunction with its Digital Media Partner, JumpTV, will offer exclusive free live video streams of the four first-round games of both the women's championship on Friday, March 6 and the men's championship on Tuesday, March 10 through the conference's official streaming video platform, BIGEAST.tv. Well that's better than nothing, right? I mean, I myself don't want to watch a conference winless Depaul take on Cincinnati, but someone does. Interesting decision to not televise that open set of four games. This is the future of sports. All of them. Including the Super Bowl. If John Thompson and John Chaney were still in the league, they would find a way to say this was racism. And 4 fewer games of Neanderthal Big Least hoops. I for one this is a good idea. Guess ND and Georgetown can't sell enough lite beer.